If not for the fact that I’m experiencing great frustration with my internet service right now, I would’ve responded to this through video already. Please do subscribe to Olly Outdoors for my next video. My current pack of choice is the Lowe Alpine Airzone Trek+ 35:45. I purchased this over Christmas and have used it extensively since. I could fill this post with detailed photos of everything I typically pack inside this one… But instead, I’ll save that for more of a review-style post. Inside the main compartment, I now keep a tiny torch suspended from the toggle used to suspend a hydration bladder. It;s the Lumo NEBO model and I’ve attached it with a carabiner. Having a torch here is very handy when the light is low and you’re searching for something inside. This is one of several tips I picked up from a Mountain Leader, during a navigation course back in November. This is something that many of us may take for granted (I certainly have done) but, when venturing off to the hills, mountains or wherever on your own, it’s worth strongly considering carry some for of emergency contact details. Along with two names and numbers, you can also add details of any medical requirements (medications, illnesses, etc.). Most of us will carry a phone or wallet… But, the chances are that the battery may die, an attendee may not be able to bypass your lock screen and, you never know, some low-life could step in and swipe them both! My ICE card is one that can be downloaded and printed off (for free) from the Ramblers website and it lives inside a freezer bag, for now. Alternatively, you can spend £5 on a laminated ICE Card which, in my opinion, is more of a long-term answer. I also keep it inside the zipped pocket of the underside of my backpack’s hood. Most of my ’emergency’ items are currently stored in the sleeping bag compartment (…Which is far too small for my two-season sleeping bag). I think most Mountain Leaders and advisors would recommend storing your First Aid Kit and headtorch towards the top of the pack. However, this setup is currently working well for me. Everyone should carry a roll of this with them! Or, if not a full roll then, perhaps a couple of metres wrapped around a drinks bottle, for example. To be specific, the brand I use is Gorilla Tape because it’s incredibly strong and, without a doubt, superior to most of the cheap stuff you can buy. Gorilla Tape held my car wing mirror together for fifteen-months, before I decided to replace it! There was a walk in December 2016, when I first went to the Black Mountains and found myself walking through the eerie stillness of cloud. 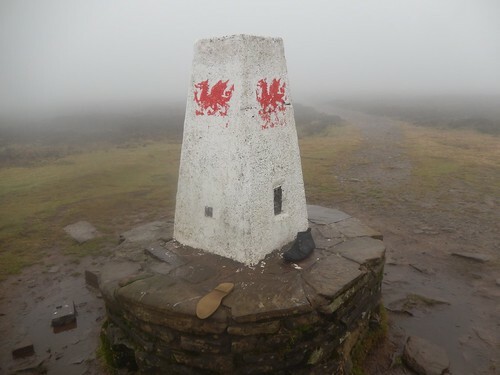 At the summit of Hay Bluff, I found a walking shoe in one position, with its detached sole lying elsewhere! I’ve no idea how much that walker must have struggled to complete their walk and return home but, I’ve always kept that image in my mind; fearful that my own soles may one day separate… When only duct tape would do! I’ll bet few of you can guess what I use this for! It’s a fairly recently addition and and exists on the right-hand pocket of my hip-belt, attached to the zip-pull with a simple keyring. I use this for making fine adjustments to the cam-locks on my Leki walking poles and, more recently, to adjust the machine screw that secures my camera to my Cullman Alpha 380 tripod. I own quite a collection of these Hot Hands hand warmers, now. Occasionally, when I make a purchase in Mountain Warehouse, the assistant behind the till will effectively give me a pack for free, as I prepare to pay for my order. Similarly, I’ve found them bundled in with the odd issue of Country Walking magazine that I’ve purchased. I cannot pretend to know how well these items do or do not work. I think I did purchase a pair, once and I carry them with me now, just in case… Have you ever had your gloves fail in terrible weather, resulting in numb and redundant fingers on each hand? These would probably help… If only you could open the bag and not lose the packaging! I hope this has been useful and informative for you. I’ve tried to think about this a little bit more, when it would’ve been easy to have gone: ‘head torch, first aid kit, keys, wallet, phone…’. I’m not going to tag anyone with this blog post but, if you can come up with your own list of five items (or fewer), I hope you’ll create something on your site. Let me know and I’ll happily include a link below. Speeds are improved on my phone. Another issue I’ve noticed is that the option to even turn wi-fi on isn’t always available from Windows 10. The manufacturers of this PC have recommend I try to reinstall their drivers. I never had this trouble with my laptop, using an otherwise identical setup. What the **** to the walking shoe. Wow. Great post and I like the Five Items idea. Thanks, Sarah. I hope you’ll consider doing your own ‘five items’ post. Really enjoyed this blog! I was expecting to already have everything that you’ve listed but actually got some great tips – especially the torch and the ICE card. Thank you, Steph. 🙂 I’m glad to hear that you’ve found items worth considering in my list.